British beauty Kelly Brook has been working in the entertainment industry for many years now and she has been involved in so many different areas of the business, proving that she has been and still is one of the top UK stars around. Kelly is a very beautiful and talented woman and we wish we got to see so much more from her in recent years. While we have not seen a lot from Kelly Brook on the acting scene in recent years, as well as not getting to see much of her on the television screens, and even her modelling work not being what it used to be, we still love getting to see and hear from her at every opportunity, which is why we love social media so much, as it gives us a small window into the life of such a star. Kelly Brook is currently enjoying a break, getting away from the cold weather in the UK and enjoying the much warmer weather in Thailand. Kelly has been travelling around Thailand with her partner Jeremy Parisi and the two have clearly been having a very good time together while over there, with Brook sharing plenty of pictures and videos on her official Instagram account. 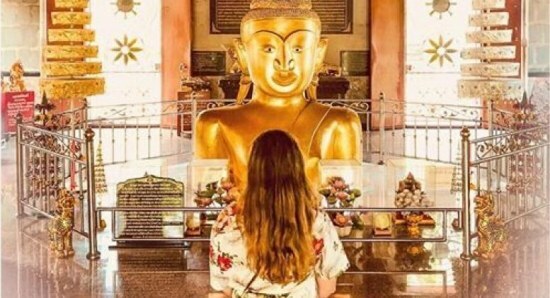 So far on her trip to Thailand, we have seen Kelly Brook enjoying some relaxing time in the pool, as well as visiting an elephant sanctuary, praying in front of a big buddha, and even enjoying some cooking lessons. We look forward to seeing plenty more pictures and videos before Kelly returns to the UK.